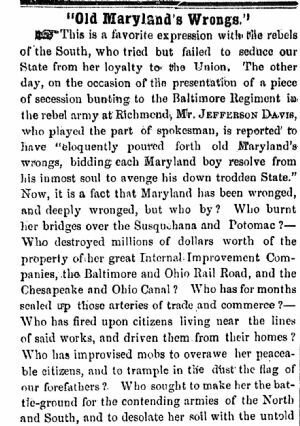 Week of July 17, 1861 - "Old Maryland's Wrongs"
Who has fired upon citizens living near the lines of said works, and driven them from their homes? Who has improvised mobs to overawe her peaceable citizens, and to trample in the dust the flag of our forefathers? Who sought to make her the battleground for the contending armies of the North and South, and to desolate her soil with the untold ravages and horrors of such a warfare? Let Mr. JEFFERSON DAVIS know that the people of Maryland ascribe all these wrongs to his minions and coadjutors, and that they felt relieved and rejoiced beyond the power of utterance when his armed hosts were driven from their borders. ENOCH LOUIS LOWE, JOHN MERRYMAN, Marshal KANE, and a few other sympathisers with his treason may have been humbled when they were not permitted to raise the standard of rebellion at his bidding, but they neither constitute the State of Maryland in their own persons, nor reflect the twentieth part of its vox populi. On the contrary, the course of the Federal Government, in depriving such disloyalists of the means of plunging the State into the whirlpool of revolution, accords exactly with the wishes of a large majority of her citizens.— They want the State to remain quiet, and are thankful to the Federal Authorities for their timely interference to this end. They are not down-trodden and oppressed, but live in peace and happiness under the Constitution and Laws of the United States; nor have they been torn from their families and pressed into the service of any army, as their neighbors of Virginia have been into that of the Confederates. They reapt and gathered their harvests with none to molest or make them afraid, and are really very much disposed to laugh to scorn the overtures of sympathy from the leader of the frightened and half-starved insurgents of other Southern States. Let Mr. DAVIS pity his own deluded followers, who are really objects of sympathy. They are far more likely to be subjugated, if they persist in their mad opposition to the authority of the Federal Government, than the people of Maryland, a large and controlling majority of whom have never had the least desire to withdraw from the Union. We know of no subjugation in Maryland, other than that of Marshal KANE and his fellow boarders at Fort McHenry, but there may be much of it further South if a returning sense of loyalty does not prompt the honest masses to seek protection under the Constitution for "life, liberty and the pursuit of happiness."